Army Sgt. 1st Class Cory Remsburg, who was recognized at President Barack Obama’s State of the Union address, received a hero’s award Thursday at the Bellagio. The 2014 Homer Deakins award, given by Ogletree Deakins, recognizes Remsburg for “selfless and courageous action” that demonstrates the true spirit of giving. It comes with $10,000 he said he will donate to the Lead The Way Fund, Inc., a nonprofit organization that raises funds for disabled Army Rangers and families of Ranger who have died, are injured or currently serving. Remsburg, of Phoenix, was nearly killed in a 2009 roadside bomb attack in Afghanistan on his 10th overseas deployment. “It was an honor to be the face of every wounded warrior,” Remsburg said after receiving a standing ovation at the State of the Union address. “His comrades found him in a canal face down, underwater, shrapnel in his brain. For months, he lay in a coma. 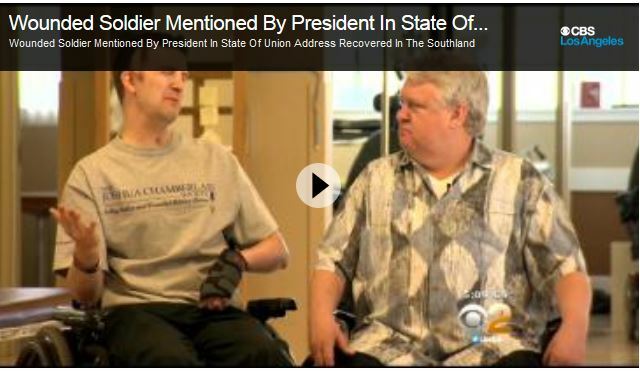 And the next time I met him, in the hospital, he couldn’t speak, he could barely move,” Obama said.